Power of the Sacred Feminine, Wisdom – GemPowerment. Reveal your light. 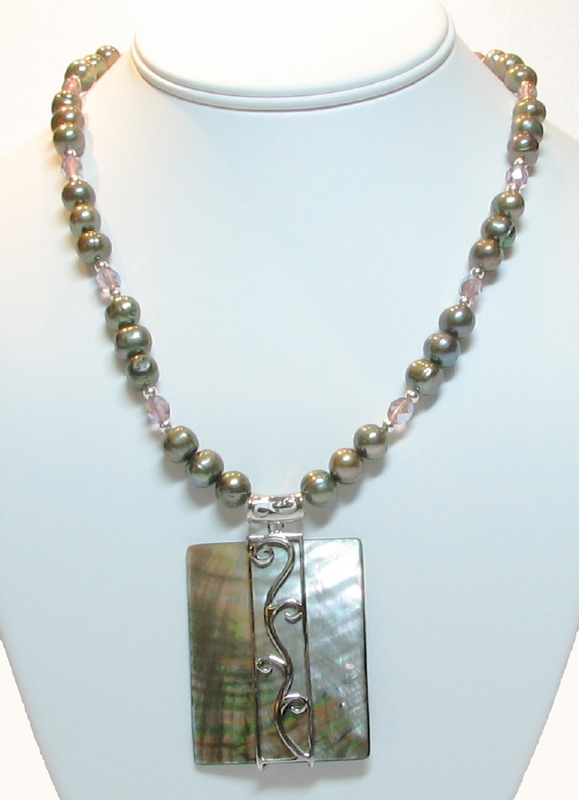 Black Mother of Pearl and Sterling Silver-framed pendant with 8mm Green Peacock Pearls, Dark Rose Faceted Czech Fire-polished glass, and Silver bead necklace. This necklace is closed with an ornate box clasp of Sterling Silver. Offered with matching 8mm Green Peacock Pearls, Dark Rose Faceted Czech Fire-polished Glass and Silver bead earrings.Mother of Pearl and Shell are about nurturing and Divine Love. The iridescent shimmering of these substances can put our etheric bodies in touch with the Angelic realm, which is very soothing. We feel accepted and loved, and able in turn to more easily express our emotions. Pearl is the perfect essence of innocence, purity and sincerity. It is significant as a transformational symbol…i.e. making something truly exceptional from adversity. Pearl is excellent to wear when one wishes to be in touch with one’s femininity. All MOP, Shell, and Pearls are also connected to prosperity and fulfillment of needs.